Recently I've seen this slogan. but it sounds like "It's nice to meet you" as if you are introduced to somebody. My question is: How can we name this linguistic phenomenon? Your slogan is an example of the pun. The pun, also called paronomasia, is a form of word play that exploits multiple meanings of a term, or of similar-sounding words, for an intended humorous or rhetorical effect. These ambiguities can arise from the intentional use of homophonic, homographic, metonymic, or figurative language. 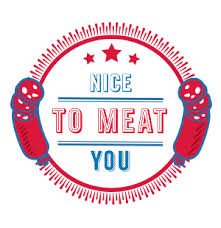 In your case there is a homophonic pun, which uses homophones MEAT and MEET. [SOLVED] What is the term for a shortened word that is pronounced based on phantom letters? [SOLVED] “kinda”, “sorta”, “coulda”, “shoulda”, “lotta”, “oughta”, “betcha”, "tseasy" etc. What are these? [SOLVED] Can I say "something in your vibe" as an alternative idiom to "to vibe with something." [SOLVED] Is there a name for words which are pronounced differently depending on which definition is being used? Is there a term for this phenomenon? "Tense" Equivalent Neutral Term for Singular / Plural Form? [SOLVED] 'Fine Results' is fine? [SOLVED] Technical term for "cityglow"
[SOLVED] Is there a well-known term for the synonym or near-synonym "telescoping" words?